We know we love Christmas here in America, but Christmas is also celebrated across the globe in ways you cannot even imagine. The religious significance of the holiday is the celebration of the birth of Jesus, while the secular festivities involve a gift-giving character who brings presents and treats to good children. Though the holiday customs vary from country to country, all include some sort of decorations, music, and specialty foods. 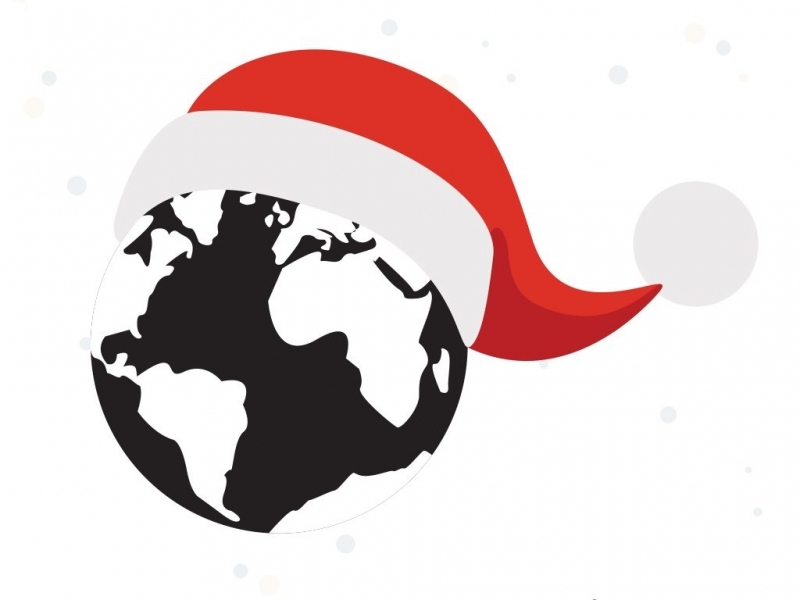 Let’s take a look at some of the most interesting ways Christmas is celebrated all around the world. Christmas is celebrated on December 25th with church services for believers. A midnight service is very popular. People of all faiths decorate their homes and gardens with star-shaped paper lanterns and some set up nativity scenes. Father Christmas is the one who brings presents to children from a horse and cart. Special Christmas cakes and sweets such as newries and kulkuls are baked and open houses abound. St. Lucia’s day is celebrated on December 13th. St. Lucia was a Christian martyr from 304 AD known for secretly taking food to persecuted Christians in the catacombs of Rome. Today, young girls dress in white dresses with a red sash and wear a crown of lights to help Lucia find her way. Special Lucia Day buns called Lussekatts are served. On Christmas Eve, a huge buffet known as julbord is eaten in courses. The feast begins with cold fish dishes and moves to cold meats, warm meat dishes, and desserts. Glogg, a sweet mulled wine, and coffee are favorite drinks for the Swedes. Homes are decorated with straw to remind everyone that Jesus was born in a manger, and the gifts are brought by small gnomes called jultomten. On this island off the east coast of Africa, it is very warm at Christmas time. Still, decorations include holly and “snow,” though neither exist there. Santa is known as Dadabe Noely and only small gifts are exchanged. On Christmas day, people everywhere, even strangers, greet one another with “Arahaba tratry ny Noely” which means Merry Christmas. The Malagasy go to their families to eat dinners of chicken or pork with rice and a special cake. Another favorite Christmas food is the lychee, a fruit which is peeled and eaten with great enjoyment. Christians in Hong Kong celebrate Christmas like many around the world, attending church services. Services are conducted throughout the day in English and Cantonese. The Christmas card tradition is to create homemade cards bearing original artwork of the Holy Family in Chinese settings. Poinsettias and nativity scenes are used for decorations in homes and businesses. Streamers and paper chains painted with the Chinese alphabet hang and sway everywhere. Christmas lights decorate many highrises in the downtown areas, lighting the way for Santa, also known as Lan Khong or Dun Che Lao Ren. Christmas day is known as Kisimusi and begins with a church service like many places. Then, people visit all of their friends and family and eat and exchange gifts all day. Favorite meals are chicken with rice which is a special treat. Often, large speakers are put into the streets and music is played loudly for Christmas block parties. People wear their best clothes and homes are decorated with ivy draped around the top of the rooms. Christmas cards may have wild animals on them and small gifts are given to children on Christmas morning. Christmas also falls in the hot summer months. Families are often celebrating their summer holidays by camping or staying at the beach. Imagine being in your bathing suit by the Christmas tree opening gifts! Presents are opened on Christmas day before the special Christmas meal of barbecued meats or seafood. Desserts, such as Pavlova, the country’s favorite, hot fruit pudding or meringues, are served to end the feast. Christmas is celebrated by the Orthodox Church, not in December, but on January 7 and called Ganna. People fast on January 6th, and then, on the morning of the 7th, they wear a traditional thin white cotton toga-like garment called a shamma. The shamma is worn to a special service held in the circle-shaped church where candles are held in a procession and communion is taken. Special foods eaten at this time of year are meat and vegetables called wat and flatbread known as injera. For Ganna gifts, children usually receive gifts of clothing. Carol singing is the highlight of the festivities in Wales. Carolers sing at dawn of Christmas morning and are invited in for snacks. There is a prize for the best new Christmas carol written that year, and it is added to the list of carols sung in future Christmas celebrations. Families love spending time together making taffy and singing carols. Orthodox Christians celebrate Christmas in Russia. Once banned by the communist regime, Christmas is again celebrated with special church services and wonderful meat and cabbage pies called pirogi and meat dumplings known as pelmeni. A porridge, kutya, is served along with honey and poppy seeds to bring happiness, success, and peace. Children carry a star and go house to house in the cold winter snows singing carols and receiving sweets.